Have the rest of the meal ready before beginning to fry the fish, since this step takes only a few minutes. Crush the cornflakes into fine crumbs. (An easy way: put cornflakes into a closable plastic bag, shut it, and roll firmly with rolling pin or heavy bottle). Have separate shallow containers for cornflakes, cornmeal and egg. Add a pinch of salt to the egg and beat well. Heat fat in a large skillet until it sizzles. While fat heats, dip each fillet into the cornmeal (or sprinkle it on), then the egg, and then the cornflakes (or pat on). Cook fish about 3 minutes per side for thin fillets (about 1/2 inch), a little longer for thicker ones. Turn carefully to preserve the crust. 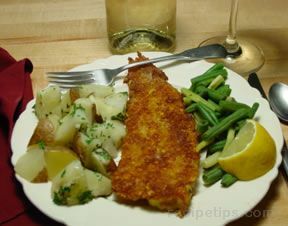 When done, fish should flake easily with a fork and be opaque. Serve immediately, with lemon slices if desired. Good with a crisp chilled sauvignon blanc.